Located in the heart of Loket, this bed & breakfast is 0.5 mi (0.8 km) from Slavkovsky Forest Nature Reserve and within 9 mi (15 km) of Karlovy Vary Golf and Racing Club and Mattoni Mineral Water. Jan Becher Museum and Elizabeth's Spa are also within 9 mi (15 km). Situated in the historical district, this hotel is 0.8 mi (1.3 km) from Slavkovsky Forest Nature Reserve and within 9 mi (15 km) of Karlovy Vary Golf and Racing Club and Mattoni Mineral Water. Jan Becher Museum and Elizabeth's Spa are also within 9 mi (15 km). Situated near the boardwalk, this luxury hotel is steps from Slavkovsky Forest Nature Reserve and Diana Lookout Tower. Karlovy Vary Municiple Theater and Market Colonnade are also within 10 minutes. How Much is a Hotel Room in Loket? Hotels in Loket start at $43 per night. Prices and availability subject to change. Additional terms may apply. 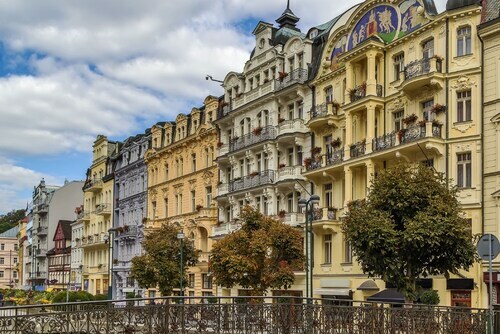 So you are looking to spend some nights in Karlovy Vary? Hoping to arrange a hotel in the Loket area? Loket boasts 6 excellent accommodation options within a 6-mile (10-kilometer) radius. Picking up convenient accommodation close to the attractions of Loket has never been more effortless. Our booking page features the Bílý Kun and Hotel Stein Elbogen, which you can find within a distance of 0.6 miles (1 kilometer) of the town center. 6 miles (10 kilometers) away from the heart of Loket, you will come across the Hotel Quisisana Palace. Alternatively, the CARLSBAD PLAZA Medical Spa & Wellness hotel is approximately 6 miles (10 kilometers) away. The Vienna House Dvořák Karlovy Vary as well as the Esplanade Spa and Golf Resort are alternate bases in Loket. Are you looking for activities? Spend some time visiting St Vladimir Church and Spa Colonnade, which you'll find in Marianske Lazne, 15 miles (25 kilometers) to the south of Loket. Some of our recommended Marianske Lazne rooms include the Dhsr Nove Lazne and Danubius Health Spa Resort Grandhotel Pacifik. 18 miles (29 kilometers) to the southwest of Loket, you'll find Cheb, which is home to the Hotel Pawlik and Francis Palace Hotel. When you visit Cheb, make sure you explore the Black Tower and Gallery of Fine Art. Ensure you get your fix of sport with a journey to Na Stinadlech, which is located 55 miles (90 kilometers) to the northeast of Loket. Modern travelers that hope to find hotels near to the action should look at the Giovanni Giacomo or the Hotel Prince de Ligne. Karlovy Vary International Airport is a primary entry point for flying into and leaving Loket. You can find it 7 miles (11 kilometers) from the downtown area. For modern travelers who hope to find a room nearby, book the Grandhotel Pupp or Hotel Olympia.